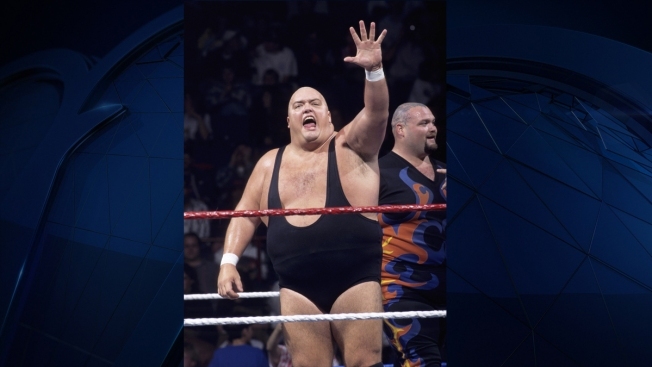 This image provided by the WWE shows professional wrestler King Kong Bundy. Promoter and longtime friend David Herro says Bundy, whose real name was Christopher Pallies, died on Monday, March 4, 2019. The 6-foot-4 (1.93 meters), 458-pound (208-kilogram) wrestler made his World Wrestling Federation debut in 1981 and was best known for facing Hulk Hogan in 1986 in a steel cage match at WrestleMania 2. King Kong Bundy, the 6-foot-4 professional wrestler best known for facing Hulk Hogan in WrestleMania 2, has died. He was 61. Bundy died Monday, said promoter and longtime friend David Herro. He posted on Facebook : "Today we lost a Legend and a man I consider family." The cause of death and other details were not disclosed. Bundy, whose real name was Christopher Pallies, was born in Atlantic City, New Jersey. The 458-pound (208-kilogram) wrestler made his World Wrestling Federation debut in 1981. He faced Hogan in 1986 in a steel cage match at WrestleMania 2, which Hogan won. WWE said he was one of the "greatest ... big men to lace up a set of boots." Hogan tweeted he was "overwhelmed" by Bundy's death. "R.I.P. big man until we meet again. HH." Bundy had guest appearances on the sitcom "Married ... with Children," in which the family on the show shared the Bundy name. He left the WWF, which later became World Wrestling Entertainment, in the late 1980s but returned in 1994 as part of The Million Dollar Corporation, a group managed by "Million Dollar Man" Ted DiBiase. Bundy had been planning to appear next month at WrestleCon in New York City.